I originally saw this on Google+, someone called Joshua Roy shared it first I think. Made me laugh. I then thought that we should be OK until some crazy fools start building pyramids again – if this were to happen this surely would mark the end of civilisation as we know it (maybe it has already finished?). I then searched the ‘net, just in case this was happening. It is! On 3rd October 2012 the Williston Herald (an online paper from North Dakota in the USofA) reported “Pyramid housing on the way?“. So, there you go. 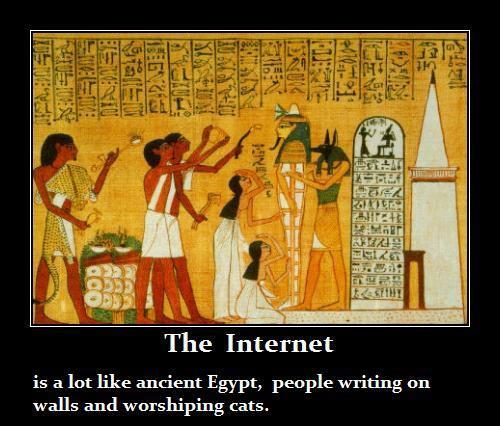 Life as we know it is now all about writing on walls, worshipping cats and building pyramids. What can go wrong? So, the Internet as we know it will be targeted by pirates and thieves who want to benefit from all its treasures without doing any of the hard work of empire building. Sometimes it seems like that is already happening!